Family of Russell Means sing on horseback in 12-hour memorial for the American Indian activist and star of Last of the MohicansIn the company of more than 1,000 mourners chanting and singing for their fallen Native American hero, a riderless horse escorted the remains of Russell Means to his first of four memorials on Wednesday. 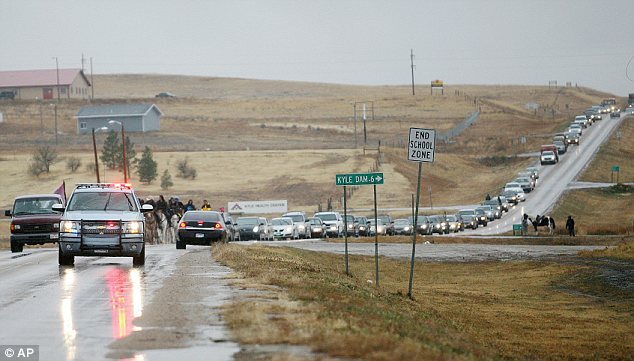 Russell Means Farewell: Son Cradles His Father on Final JourneyThis moving image from yesterday’s honoring ceremony for Russell Means shows one of his sons, Tatanka Means, carrying his father’s urn into the Little Wound High School in Kyle, South Dakota on the Pine Ridge Indian Reservation. The 12-hour service was attended by more than 1,000 family members, friends and supporters. The ceremony was led by Sundance Chief Leonard Crow Dog, who was with Means when he walked on. He said Means’ soul would travel over four days to the spirit realm, known in Lakota tradition as Happy Hunting Grounds.Comment: For more on Russell Means, see Russell Means Was a Fighter and Russell Means Dies.